This page would optionally be password protected for the Bridesmaids only. This is only an example for Demo purposes. We can post any ideas, make decisions on dress styles, shoes, jewlery, hair and color swatches here. Thanks for all your input and for helping me with some of the decision making. I would love for all of you to feel great, beautiful and most of all confortable with everything you'll be wearing, so post your ideas and suggestions. I love this dress style, let me know what you think. I'm still debating between the main color, so any input on your favorite, it'll be great!� I sort of like the chanpagne color but I'm also liking the ice blue, pink and sage.... help! I need to decide on the final color scheme in the next two weeks!� This design is called Nikki, and the fabric is Satin.� We can all go for a trial and see how you like the fit. Check out this really cute flowergirl dress I found for my little cousin Alice! I just love it! The dress also comes in the same shades I like, so it's perfect! 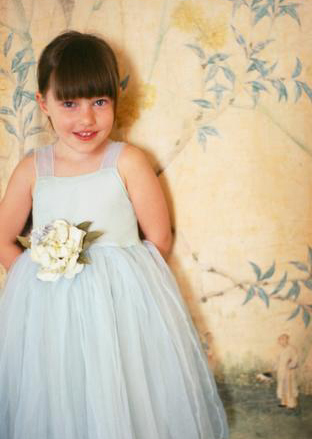 Alice will be our flowergirl, she's 6, so I think she'll look so adorable! Hi Girls, Just wanted to submit my vote for the dress style Christie picked, I love it! I'm also leaning toward the champagne color. Let's setup the date and time to go and try it on soon. I need some help with shoes, ladies. Any ideas? Hello ladies! Here's a pair of shoes I found online, let me know what you think.... I think they would go great with the champagne color dress. I found these really cute chandellier earings, they might go great with the bronze shoes Erika found. BTW, love the shoes! I'll keep looking for more styles and see which one we like best.